Potatoes usually mature 90—120 days after planting (depending on the variety). You can harvest a few at a time and leave the rest until you are ready to eat them. When you "rob" potatoes—for smaller, more tender potatoes—be careful not to damage the plant. Harvest remaining potatoes when the plants wilt and turn brown. As the plants grow, mound the soil around the plants until at least 6" of the plants are covered. Maintain soil cover for tubers as they expand. Tubers exposed to light may have bitter-tasting green areas and should not be eaten. 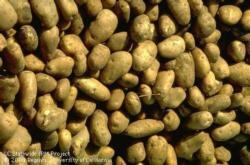 Potatoes are sensitive to soil moisture. Maintain a consistent soil moisture as much as possible. * Many other varieties may also do well here in Santa Clara County. This list is based on UC Master Gardener trials, taste tests, and feedback from local growers.